I'm taking a step sideways today to blog about something not to do with France. In my other life I’m a writer (what do you mean, you couldn’t tell?) and something exciting is happening there. On November 12th, an e-book is being published: One Word Challenge, by Talkback Writers. 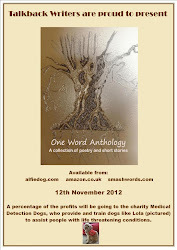 This is an anthology of poetry and flash fiction written by the members of the Talkback forum of Writing Magazine (UK). The pieces are all written in response to a monthly challenge: a word is chosen, and we have to write about that word in any way we like, within strict limits - 40 lines of poetry, or 200 words for fiction. The winners of each month’s competition choose the next word, and judge the entries. The charity trains dogs – not any particular breed, but chosen for their intelligence and their ability to learn – to accompany people with certain medical problems. Our little friend, Lola, lives with poet Liz, who suffers from diabetes. Her blood sugar can drop without warning, even with all the modern aids available. Lola, with her heightened senses, can tell when it is about to happen and will warn Liz, so that she can take glucose and stop herself from falling unconscious. You can read more about Lola (and Liz) here. This is vital work, and could help a lot of people with Liz’s condition. The dogs can also be trained to help with other illnesses, and possibly even to sniff out cancers. We’d very much like to help them, and so 10% of all proceeds will go to supporting them in their work. I hope some of you will think of buying the ebook ; it will be for sale through Amazon and Smashwords, but also direct from the publisher at http://alfiedog.com/ebooks where it will be 99p. I am proud to say that I have four stories in there, which I hope you’ll enjoy. Go on – that’s a good read for under a pound; and it could help a lot more people to live normal lives. And such a valuable cause to support. I'm sure anyone who buys the anthology will get a very entertaining read. Well, Lola sounds a bit French! Well, she is half poodle! Thanks for your comments, Marion. In my usual slow on the uptake fashion it has only just come to my attention that the OWC Anthology isn't just about the monthly winners. I'd have submitted if I'd known! Now I shall have to open a Paypal account - or could I use my credit card with Alfiedog? Through Paypal on Alfiedog, and no e-reader needed - apparently you can read these things on computer or print off a pdf file. Marvellous, isn't it?